Our mission is to provide educational services that offer opportunities to learn, share, explore, and embody methods for living within the means of our local resources and promote ecological literacy. 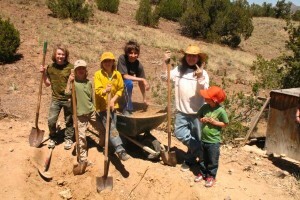 We emphasize affordable low tech solutions and community involvement, encouraging sustainable systems and lifestyles to take root in every household and community in Northern New Mexico and beyond. We enjoy developing relationships with kids and classroom groups. That way we can layer our experiential curriculum to teach about tracking natural resources for living in harmony with the earth’s natural cycles. The most valuable approach is to experience Ampersand during a field trip, and then follow up with classroom and schoolyard visits in order to explore integrating sustainable methods and practices in the school environment. 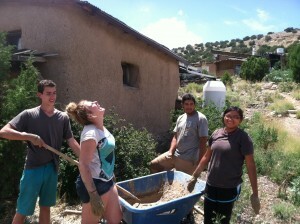 Nothing compares to actually experiencing a site that embodies sustainable living, with real people who actually do it. This can be a life changing experience for students. It may reinforce and encourage an existing enthusiasm for living close to nature, or it may be an introduction to approachable systems that support self sufficiency. A visit to Ampersand can open one’s eyes to a way of living in relationship with the resources that the earth freely provides like the sun and rain and earth on any given site. We tour school groups through our site with an explanation of the workings of the technologies and systems. The field trip includes experiential opportunities as well. 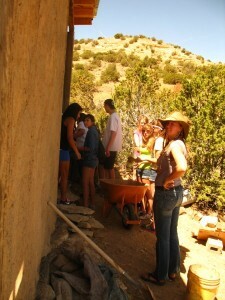 Students may get a chance to build with earth or contribute to a land restoration or gardening project. We also facilitate a discussion with the students in order to begin a conversation about sustainable living that can carry into the future. We will visit your school and offer a program that will fit into your current curriculum. We like to make learning about the basic elements of sustainability fun and engaging. And we know the more engaged students are, the better they will perform in school. Our curriculum can focus on the criteria designated by the Common Core standards. Class curricula can include measurable goals such as learning about heat transfer mechanisms in passive solar technologies, using rainfall collection formulas to calculate water storage needs, and identifying different soil types for food production and adobe building. Your schoolyard likely has many potential sustainable projects. A sloping area of land will shed storm water that can be harvested within the ground to enhance existing vegetation or for creating a new rain garden. Wild plants within the schoolyard can be identified and teach us about the natural history of the area. Your school might like guidance for beginning or maintaining a vegetable or wildlife garden. We can bring an array of solar cookers to demonstrate with. We can conduct seasonal visits to keep students abreast of how the natural environment and appropriate interaction with it changes through the year. 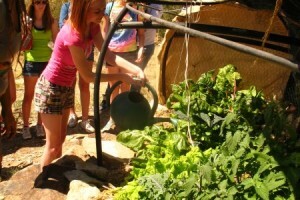 We support integrating sustainability education into the school experience. We consult with teachers and administrators on how to enhance the sustainability curriculum or the overall student experience to embody this value. We can support science grants that schools receive, building curriculum around the initial grant concepts. Schools are filled with great teachers who simply don’t have the sustainability experience necessary to provide this sort of education. We can consult on creating systems within the school that promote a conscious use of resources like paper, electricity and water. School staff may wish to integrate a greenhouse, garden, or other endeavor into the school experience. We can provide regular guidance as to proper maintenance for these systems, as well as ideas for integrating student involvement. Amanda Bramble, director of Ampersand Sustainable Learning Center, has been teaching about self sufficiency and sustainable systems for twenty years. Her curriculum connects information about local natural processes with experiential activities, and reinforces a natural sense of caring for our environment. Her primary goal is to foster a sense of belonging to the natural world and to share the joy of learning and creativity within it. 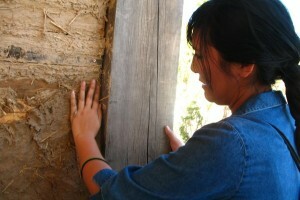 Her experience includes developing and teaching grade school curriculum through the Center for Biological Diversity, developing youth programs through the San Francisco League of Urban Gardeners, teaching at the Santa Fe Community College, UNM’s Sustainability Studies program, Ecoversity, and at Ampersand Sustainable Learning Center. 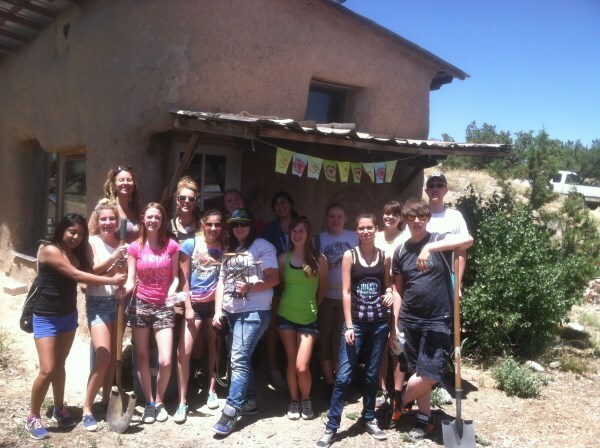 Contact Amanda Bramble at amanda@ampersandproject.org or 505 780-0535 to talk about your school group’s needs. Thanks!